Are you looking for a quicker and easier way to fabricate complete dentures? Do you want to achieve more predictable results? If yes, then why not think about combining complete denture prosthetics with CAD/CAM technique. Read on to learn why. Thanks to digital technologies, complete dentures can be manufactured in only a few steps in a quick and predictable way. CAD/CAM makes this possible. A new process allows you to fabricate a prosthesis from two different material discs in your dental laboratory and you and your patients will be impressed with the esthetics: “Digital Denture”. It is a manufacturing process for the rapid digital production of removable dentures. The process integrates the treatment steps in the dental practice with the digital manufacturing processes in the lab. Exclusive design software and coordinated materials, combined with well-designed manufacturing strategies and the cutting-edge PrograMill milling equipment platform, provide predictable and consistent results. Digital Denture helps users save time compared with conventional denture fabrication methods. They benefit from shorter manufacturing times, fewer manual working steps and fewer interruptions in the workflow than with conventional procedures. In addition, it is no longer necessary to cast and articulate plaster models. Model analysis and tooth setup can be completed in considerably less time than with conventional methods. Digital Denture covers the following indications: complete dentures (upper and lower jaw), single-arch complete dentures (upper or lower jaw), duplicate complete dentures and immediate complete dentures. The denture base and the dental arch are milled using digital technology. 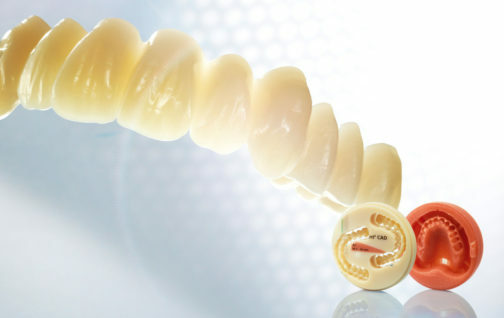 An innovative procedure is used for this purpose: In a first step an oversize dental arch is milled. Only the basal surfaces have a precise fit from the very start. Once the dental arch has been bonded to the denture base quickly and easily, the denture is milled to its final dimensions using precision milling. Excess bonding material is removed in the process. All manufacturing steps are coordinated with each other. The user is guided through the entire process. Since the process is validated, sources of error can be virtually ruled out. This leads to increased process reliability, stable, predictable and controllable results and standardized quality. You and your patients will be pleased with the results. The dentures are not only esthetically pleasing, but also extremely fracture resistant and easy to clean as they are free of interdental gaps.